When writing about any of the great ancient Stoic philosophers—like ediarcus Aurelius, Seneca, Epictetus, Cato, Zeno, Cleanthes, Hecato, or Musonius Rufus—it’s important to remember that these are only the Stoics whose names survive to us. It’s a great miracle that Marcus Aurelius’s private journal, Seneca’s letters, Arrian’s notes of Epictetus’s lectures survived thousands of years. But it’s a great tragedy that the legacy of dozens or hundreds of other brilliant, brave minds are lost to us. It’s also always important to remember that Stoicism is a philosophy of action. Consider that Cato is regarded by many of the ancients—including Seneca, who writes of him repeatedly—as the greatest Stoic. He didn’t write anything down. We only have the anecdotes by those admirers who observed Cato truly living the Stoic values, each and every day. Below are introductions to three ancient Stoic women—Porcia Catonis, Annia Cornificia Faustina Minor, and Fannia—whose legacy lives on only thanks to stories recorded by those inspired to do so. Following the ancients are some of today’s famous female Stoics, who have made known their study of Stoicism known and the role its played in their lives and careers. Porcia Catonis lived in the 1st century BC. 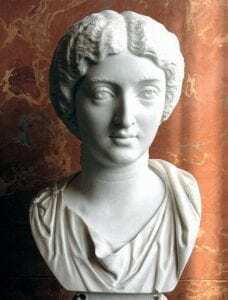 She was the daughter of Marcus Porcius Cato Uticensis—Cato the Younger—and his first wife Atilia. She was a contemporary of Cicero and the Stoic Posidonius of Rhodes. She is perhaps best known for being the second wife of Marcus Junius Brutus, the most famous of Julius Caesar’s assassins, and for her suicide, allegedly by swallowing hot coals. Portia was born between 73 BC and 64 BC, several generations before Seneca, Epictetus, and Marcus Aurelius. Only a few anecdotes survive to give us a portrayal of Porcia. Among Plutarch’s series of biographies of famous men include those of Porcia’s father, Cato the Younger, and her husband, Brutus. And still more true is it that the daughter of Cato was deficient neither in prudence nor courage. 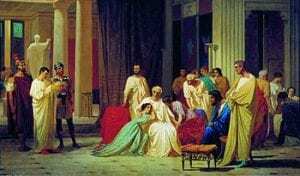 She was the wife of the Brutus who slew Caesar, was privy to the conspiracy itself, and gave up her life in a manner worthy of her noble birth and her lofty character, as is told in the Life of Brutus. This Porcia, being addicted to philosophy, a great lover of her husband, and full of an understanding courage, resolved not to inquire into Brutus’s secrets before she had made this trial of herself. She turned all her attendants out of her chamber, and taking a little knife, such as they use to cut nails with, she gave herself a deep gash in the thigh; upon which followed a great flow of blood, and soon after, violent pains and a shivering fever, occasioned by the wound. Which words having spoken, she showed him her wound, and related to him the trial that she had made of her constancy; at which he being astonished, lifted up his hands to heaven, and begged the assistance of the gods in his enterprise, that he might show himself a husband worthy of such a wife as Porcia. So then he comforted his wife. As for Porcia, the wife of Brutus, Nicolaüs the philosopher, as well as Valerius Maximus, relates that she now desired to die, but was opposed by all her friends, who kept strict watch upon her; whereupon she snatched up live coals from the fire, swallowed them, kept her mouth fast closed, and thus made away with herself. And yet there is extant a letter of Brutus to his friends in which he chides them with regard to Porcia and laments her fate, because she was neglected by them and therefore driven by illness to prefer death to life. It would seem, then, that Nicolaüs was mistaken in the time of her death, since her distemper, her love for Brutus, and the manner of her death, are also indicated in the letter, if, indeed, it is a genuine one. As Plutarch states, if the letter was genuine Brutus lamented her death and blamed their friends for not looking after her, which suggests that Porcia did not commit suicide, but died of some lingering illness. To Cato’s daughter, Brutus’ Portia. This young Lady being excellently well seen in Philosophy, loving her husband well, and being of a noble courage, as she was also wise. Annia Cornificia Faustina Minor was the daughter of the Roman emperor Marcus Aurelius and his wife, Faustina the Younger. She was sister to Lucilla and Commodus. When Commodus succeeded her father as emperor and, sometime between 190 and 192, he ordered the deaths of Cornificia’s husband, her son, her brother-in-law and her sister-in-law’s family. Cornificia survived the political executions of Commodus, but when she was in her fifties the tyrannical emperor Caracalla had her executed, by forced suicide, as part of a purge. She first uttered many laments, and then, inspired by the memory of her father, Marcus, her grandfather, Antoninus…She ended by saying: “Poor, unhappy soul of mine, imprisoned in a vile body, fare forth, be freed, show them that you are the daughter of Marcus Aurelius!” Then she laid aside all the adornments in which she was arrayed, having composed herself in seemly fashion, severed her veins and died. Fannia is the daughter of Thrasea—the great Stoic hero who led the principled Stoic Opposition against Nero in the 1st century. She was married to Helvidius Priscus, who, like his father-in-law, was distinguished for his courageous opposition to the autocratic rule. Fannia too was regarded for her part in the Stoic Opposition. Much of what we know about Fannia comes from the letters of Pliny The Younger. She twice followed her husband into exile and was once exiled herself for instigating a biographical book in praise of her husband. She enlisted the Stoic Herennius Senecio to write it. Senecio would be executed for his role. At Senecio’s trial, he blamed Fannia for having made the request. Fannia was threatened to confirm if it was true. “Not a word did she utter to show that she shrank from the perils which threatened her,” Pliny wrote in a letter to Priscus, “More than that, though the Senate had passed a decree – under compulsion and owing to the dangers of the times – that the volumes in question should be destroyed, she took care to preserve and keep them after her goods had been confiscated, and she even carried them with her into the exile of which they were the cause. I am really troubled at the ill-health of Fannia. She contracted her disease by nursing Junia, one of the Vestal Virgins, a duty she undertook at first voluntarily – for Junia is a relative of hers – and then at the bidding of the high-priests…And it was while Fannia was busily engaged in this charitable office that she fell into her present dangerous condition. She cannot shake off the fever, her cough is growing worse, she is terribly emaciated, and subject to great exhaustion. Yet her mind and spirit are wonderfully strong, quite worthy of Helvidius her husband and Thrasea her father, but in all other respects she is losing ground, and the sight fills me not only with apprehension but with positive pain; for it grieves me to think of so excellent a woman being torn from all of us, who will never, I fear, see her like again. What a pure, upright life she has led! How dignified she was, and how loyal!…What a delightful and charming woman she was, commanding not only deep respect, but love, as but few women can! Will there ever be another whom we can point to as a pattern to our wives? Or another from whom even we men may take a lesson in personal courage – one who inspires us when we see and hear her with the admiration we feel for the heroines of history about whom we read? Michele Tafoya is one of the most familiar faces in professional football with over 200 games in her career. Since 2011, more than 20 million people tune in each Sunday night to see her as the sideline reporter for NBC’s Sunday Night Football. Michele has been a powerful advocate for Stoicism and diligent student of the philosophy over the last few years. It was partly through her influence that The Obstacle is the Way made its way through the NFL and the 2016 Summer Olympics. She is also a big fan of the Daily Stoic book and regularly shares passages from the book with her followers on Twitter. Tafoya expanded on her study of Stoicism and how she applies to her life and career in our interview with her, which you can read here. When you think ancient philosophy, you might not also think heavy metal and guitar solos but the two are more connected than it may seem. Nita Strauss tours the world as the lead guitarist for Alice Cooper (!) and is regularly ranked as one of the best female guitar players in the world. She also happens to be a practicing student of Stoic philosophy. One thing you realize quickly as a female in the music industry is that everyone has a strong opinion about you. It’s been my challenge to isolate my view of myself from anything people say about me, the good or the bad. At the end of the day, none of the criticism or the accolades changes anything real in my life. About two years ago, I stopped reading comments on news articles about me altogether. It was becoming too hard not to speak up and defend myself, and I realized if I responded in kind to every rude comment someone made about me, I’d be drowning in anger and frustration all day long. To paraphrase Marcus Aurelius, every day we all meet ungrateful, violent, treacherous, envious, uncharitable men. Once you see what sort of person they are, you will realize there is no need to be racked with anxiety that they should hold any particular opinion about you. Nita also talked about the music industry’s ego problem, why she performs with t-shirts that say “Ego Kills Talent” and “Stay Humble or Be Humbled,” how she was initially introduced to Stoicism, as well as her broader message to the Daily Stoic community. You can read the interview here. Arianna Huffington is the founder of the Huffington Post and Thrive Global, as well as a bestselling author of Thrive: The Third Metric to Redefining Success and Creating a Life of Well-Being, Wisdom, and Wonder and The Sleep Revolution: Transforming Your Life, One Night at a Time. People look for retreats for themselves, in the country, by the coast, or in the hills . . . There is nowhere that a person can find a more peaceful and trouble-free retreat than in his own mind. . . . So constantly give yourself this retreat, and renew yourself. It perfectly illustrates the current moment – right now that first retreat he’s talking about is mostly digital. That’s how we get away from ourselves — by retreating into technology and social media. But the only way to find peace and thrive is to take breaks from the world and make time to regularly renew ourselves by reconnecting with ourselves. To learn more about her study of Stoicism, the importance of rest and work-life balance, the lost connection between politics and philosophy, and why the educational system needs to do a better job introducing philosophy to young people, read our interview here. The superstar author of the best-selling book series in history happens to be a pretty big fan of Marcus Aurelius. She’s tweeted her affection for the Roman Emperor. And The Crimes Of Grindelwald—the second instalment in the Fantastic Beasts film series and a continuation to the Harry Potter series—ends with what fans call a bombshell of a cliffhanger. It is revealed that the character Credence Barebones is actually the brother of Albus Dumbledore, the headmaster throughout most of the Potter series. As it relates to our purposes—Credence Barebones’ real name? Aurelius Dumbledore. The site’s source code timestamps Rowling adding that image two years and a month before the first of the Fantastic Beasts films released. 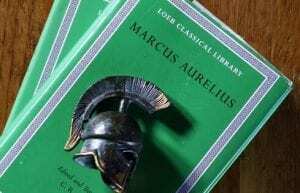 It is the Loeb Classical Library edition of the works of Marcus Aurelius (volume 58, simply titled “Marcus Aurelius”), edited and translated by C.R. Haines, and first published 1916 (revised 1930). It is the only widely available text that gives both the original Greek text as well as an English translation. 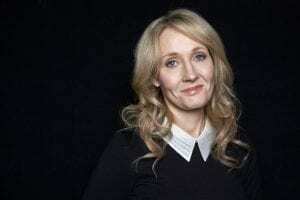 The question remains if J.K. Rowling took the name for her character simply because of her admiration for the philosopher’s writing, or if she is actually drawing inspiration from his life. You might recall that one of the first things Marcus Aurelius did when he ascended to the throne was appoint his adoptive brother Lucius Verusa—ne’er-do-well who never proved himself worthy of Marcus’s respect—co-emperor. The two co-ruled in until Lucius’ death eight years later. 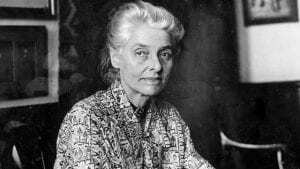 Beatrice Webb was an English sociologist, economist, socialist, labour historian and social reformer. It was Webb who coined the term collective bargaining—the negotiating process aimed at regulating working salaries, working conditions, benefits, and other aspects of workers’ compensation and rights for workers. She was among the founders of the London School of Economics and played a crucial role in forming the Fabian Society. Professor Nancy Sherman is not only a professor of Stoicism but specifically an expert on Stoicism in the military, writing the book Stoic Warriors: The Ancient Philosophy Behind the Military Mind. Her credentials as a scholar are unparalleled. She is a distinguished University Professor and Professor of Philosophy at Georgetown University and holds a Ph.D. from Harvard University in philosophy, where she received Harvard’s George Plympton Adam’s Prize for the most distinguished doctoral dissertation in the area of history of philosophy. She is the author of several other books, including The Untold War: Inside the Hearts, Minds, and Souls of our Soldiers. Stoicism has blessings and curses. If we think we are bullet proof, whether as civilians or soldiers, we are sorely misled and put ourselves in grave psychological danger. At bottom, we become unprepared for loving and losing and being the kinds of object that can be loved or lost, by parents, spouses, and children alike. In war and peacetime, as combatants or noncombatants, we may face unspeakable horrors and life threats and indignities, large and small. But the very numbness that can be so adaptive to survival, can also erect walls that stand in the way of human attachment and trust. I am all for Stoic teachings of empowerment of agency. But we are, as Marcus Aurelius knew well, citizens of the universe, attached to each other, and deeply affected by the social worlds and practices and institutions of which we are a part. To forget our membership and responsibilities in the social world and how that affects our life chances is to forget who we are. 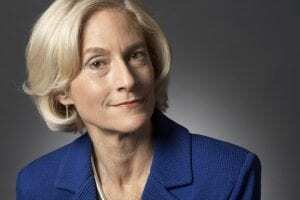 Martha Nussbaum is one of the most renowned and respected philosophers living today. 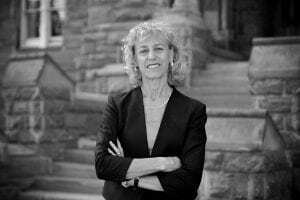 She is the current Ernst Freund Distinguished Service Professor of Law and Ethics at the University of Chicago, where she is jointly appointed in the Law School and the Philosophy department. She has a particular interest in ancient Greek and Roman philosophy, political philosophy, feminism, and ethics, including animal rights. She is the author of a number of books, has received more than 56 honorary degrees from colleges and universities around the world as well as the Kyoto Prize in Arts and Philosophy. Nussbaum, like Sherman, is an earnest student of Stoicism whose work has been influenced by the Stoics, but she is not an outright endorser. In our interview, she points in several instances where she disagrees with the Stoics on topics such as animal rights and grief, as well as her reticence to tell people how to live their lives. For instance, she calls her theory of emotions a “Neo-Stoic” theory. The most fertile idea of the Stoics, in my view, is their analysis of emotions as containing evaluative thoughts about what is most important for one’s well-being. That view I find basically correct, though in need of a lot of further work. Their normative analysis of the emotions seems wrong to me, namely that we should get rid of them all, but they are pretty on target in their critique of anger. 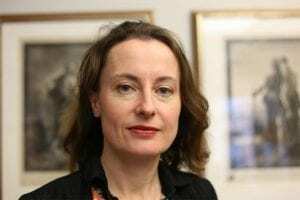 Emily Wilson is professor of Classical Studies and graduate chair of the Program in Comparative Literature & Literary Theory at the University of Pennsylvania. Wilson attended Oxford University (Balliol College B.A. and Corpus Christi College M.Phil.) and Yale University (Ph.D.). In 2006, she was named a Fellow of the American Academy in Rome in Renaissance & Early Modern scholarship. She has been a well-known name in the Stoic community due to her masterful translations of Seneca as well as her biography of the man. She has most recently made headlines (including The New York Times) with her new, contemporary translation of The Odyssey, and we had the opportunity to ask her all about that. I find helpful the Stoic notion of indifferent things—all the stuff that doesn’t matter or matters a relatively tiny amount, and of thinking through what ideas, including false ideas, my feelings might be based on. It’s cognitive therapy but it’s also Stoicism. I also find that reading Seneca can cheer me up, even apart from any ethical or psychological tips I might glean, because his style is so effective; it’s absorbing and fun, and it’s hard to feel angry or upset when you’re busy following a rhetorical avalanche. A while ago, I re-read Seneca’s On Anger during a particularly difficult and enraging time in my personal life, and I did genuinely find it helpful. It’s useful to have a reminder of how much being angry can hurt the person who is indulging in the feeling. I try not to be angry, and also not to be passive or ignore what’s wrong; it’s a tough balance. I like that Seneca and the other Stoic-influenced writers are so deeply interested in these essential daily questions of how to manage our feelings, and how feelings relate to action.